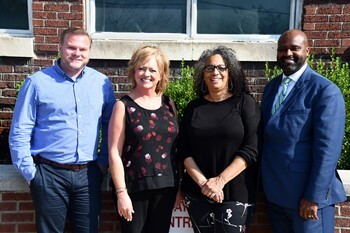 The Marshall University Divisions of Academic and Student Affairs has partnered with the South Central Ohio Educational Service Center to offer a series of student programs at the ESC in New Boston, Ohio, and on the campus of Marshall University, in Huntington, W.Va.
“We want students to understand the opportunities they have for college and how to be more successful later in life through the experiences they will have on a larger college campus. So we wanted to get them there to be indoctrinated to our traditions and to see how we can help them on their life journey,” said Dr. Timothy Melvin, assessment coordinator at Marshall University. Beginning on Oct. 4, students will attend sessions on student financial assistance, the college experience, and career education from 9:30 a.m. to 1:30 p.m. at the ESC in New Boston. Also, students will have the opportunity to speak to academic and student support office staff and complete a free Marshall University Application. Marshall University mascot Marco will also be there for a special appearance. “We’re going to have different offices from around the campus there to talk about the services and support that we can provide, but I’m most excited about the evening event,” said Cedric Gathings, vice president for student affairs at Marshall University. From 5:30 p.m. to 7:30 p.m. that evening, parents and families are invited to Parent and Family Night where ESC Superintendent and Marshall Alum Sandra Mers will moderate a panel discussion hosted by university administrators and staff on topics that include the admissions process, student financial assistance, housing, and more. “Our goal is to provide every avenue and resource possible so the students can achieve their own goals. Some won’t go to college, and that’s perfectly fine. But we want to give them any and every opportunity we can. Marshall is one of those opportunities, and we’re excited they have decided partner with us,” Mers said. Students who attend with their parents and families and remain at the evening event on Oct. 4 will have the opportunity to win an Apple iPad or an Apple Watch! Must be present to win. On Oct. 12, high school juniors and seniors from Adams, Jackson, and Scioto counties are invited to ride their school’s bus to the campus of Marshall University. Upon arrival, students will be escorted on a campus tour, receive a free boxed lunch, and attend a college fair in the Campus Rec Center. At the fair, students will have the opportunity to explore various majors and minors from all participating colleges and explore career pathways. Finally on Nov. 10, high school juniors and seniors and their families from Adams, Jackson, and Scioto counties are invited to join Marshall University at 11 a.m. for a special tailgate leading up to kickoff of the Marshall vs. Charlotte football game at 2:30 p.m. The event includes a cookout and entertainment, and a tour of the Marshall University Freshman Residence Hall. Each student attending from these three Ohio counties will also receive up to three free tickets to the game! Free tickets are provided for the student, and two parents/adult guardians only. To attend this tailgate event, please RSVP by Nov, 2 at www.marshall.edu/academic-affairs/tailgate. Kelli Johnson, co-director of the President’s Commission on Diversity and Inclusion on Campus, said these events are intended to help parents realize the campus is a safe and welcoming environment for all students. “Everyone is welcome, both on campus and in the community. We really work very hard at Marshall to make sure everyone is included regardless of race, or socio-economic status, or religion,” Johnson said. For more information about these events, visit the Marshall University Division of Academic Affairs online at https://www.marshall.edu/academic-affairs/scoesc/. For more information about the ESC, visit online at www.scoesc.org, or follow on Facebook, YouTube, and Twitter.